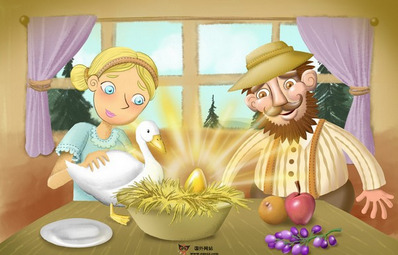 One morning a countryman went to his goose's nest, and saw a yellow and glittering egg there. He took the egg home. To his delight, he found that it was an egg of pure gold. Every morning the same thing occurred, and he soon became rich by selling his eggs. The countryman became more and more greedy. He wanted to get all the gold at once, so he killed the goose, when he looked inside, he found nothing in its body.